In my family cauliflower is one of those vegetables that you either love or absolutely hate. I am yet to hear anyone at our dinner table, when cauliflower is being served, say, "eh, cauliflower, it's ok". I get either a resounding "yuck" or a jubilent "gimme some more!" Just like cauliflower's hit or miss on the dinner table, cauliflower has a similar personality in the garden. You either love to grow cauliflower (probably because you love to eat cauliflower), or you hate growing cauliflower regardless of whether you like eating cauliflower or not. The reason being, cauliflower can be stressed out fairly easily. Cauliflower does not like getting hit with frost, nor does cauliflower like extreme heat and just when you thought your cauliflower is in full swing, you get some cooler weather which slows your cauliflower growth down. Even with cauliflower's split personality, there are some steps you can take that will help ease that a bit, making it possible to have a less stress free experience with the cauliflower you are growing in your home vegetable garden. Everything in your garden starts with the soil. I don't care how good your seeds or plants are, or where they came from, if you have bad soil, you won't grow much for long. Cauliflower likes a neutral soil on the pH scale. That is 7.0, however anywhere from 6.5 to 7.5 will work. If you are adding ample amounts of green and brown material to your composting operations you should be fine. Take a pH reading just in case. Sow your cauliflower seeds indoors about 4 weeks prior to the last frost in your area making sure your cauliflower seeds are not planted any deeper than a half inch. You can also sow cauliflower seeds directly into your garden if you have a season that lasts at least eighty days. Space out your cauliflower seeds (or plants) in your garden bed at least fifteen inches. Cauliflower can be susceptible to various root diseases so the the more room you can give their roots, the better it will be for your cauliflower. Cauliflower likes a moderate watering. Overwatering can cause root damage, so keep a measurement on how much water your cauliflower are getting. Obviously you can not stop the rain if you get that in abundance, but you can control your own watering, so be sure to monitor what you are doing. As for sunlight, cauliflower does best in full sun but will tolerate light shade. Cauliflower requires a lot of nutrients, even beyond your normal composting. Compost and manure teas work great to replenish the soil as does fish emulsion. Finally, with cauliflower we have to talk about blanching. 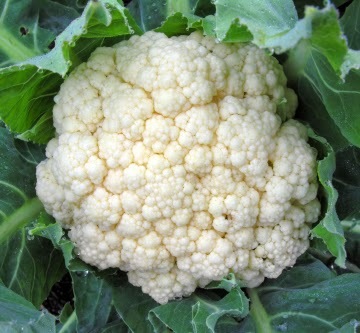 Blanching is the process of taking the leaves of your cauliflower plant and folding them over the cauliflower head. This is to prevent the amount of light the cauliflower head receives. Even if you grow self blanching varieties you will still need to do some blanching work of folding over some of the leaves. So keep an eye on your plants. When the cauliflower head is two to three inches, you can start blanching. Garden Definition: What is Club Root?